School Visit Survey Part 3: Is There a Gender Gap? Please see our first post for information about how we categorized gender and race/ethnicity. Is there an earnings gap? As we mentioned in our last post, 8 percent of our survey respondents did all of their school visits for free. The following chart excludes this 8 percent. It shows the average charge for only those respondents who charged. Male respondents and female/non-binary respondents had close to equal per-day rates. This was true at almost all levels of number of books published. Female/non-binary and male respondents are charging similar rates at most career levels. 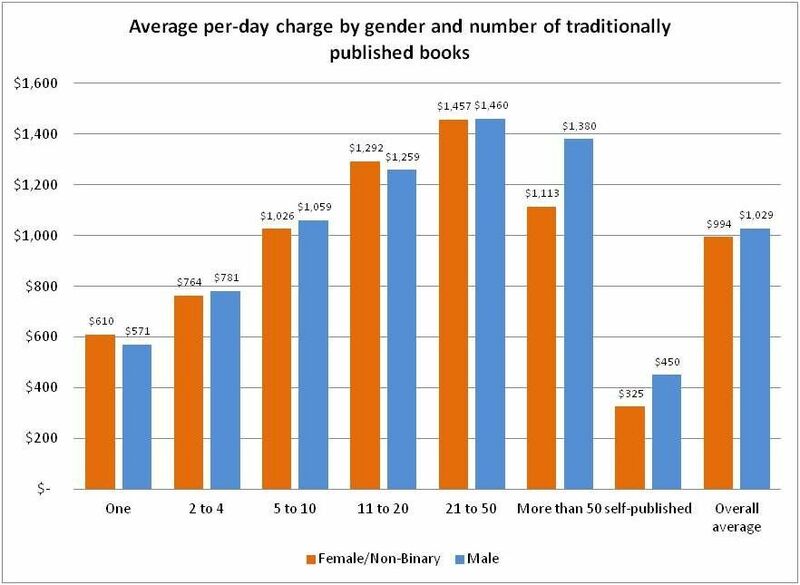 At two points male respondents are charging more than female/non-binary respondents: people who have published more than 50 books (5 percent of respondents), and self-published authors (3 percent of respondents). While there is not a large gap between male and female/non-binary respondents in terms of rate, there is a significant difference in the total number of school visits done in the last year. (Note that the following graph includes all respondents – including those who do all visits for free). 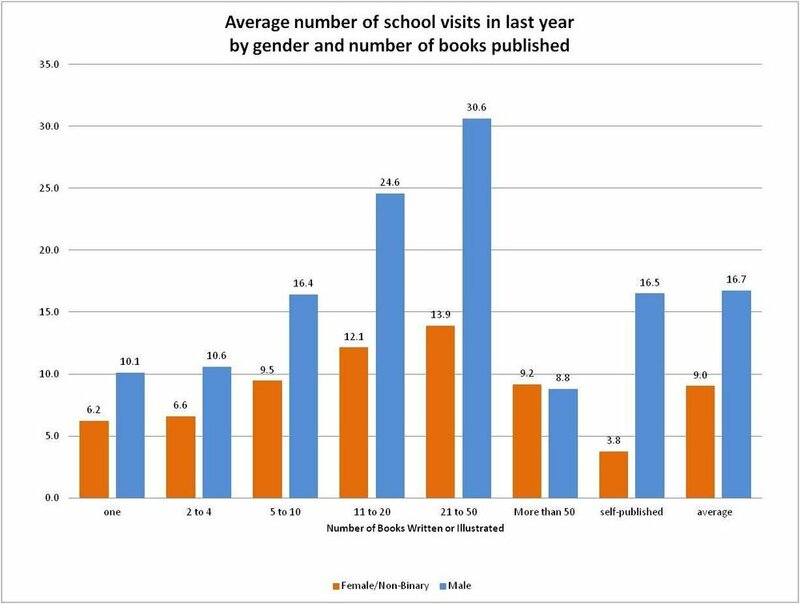 Female/non-binary respondents did an overall average of 9 school visits in the last year. Male respondents did almost twice as many - an overall average of 17 school visits. There appears to be a gap at all career stages, except for those creators who have published more than 50 books. Debut male creators (those who have published only one book so far) did more school visits than female/non-binary creators who have published 5-10 books. Anecdotally, authors have shared stories about feeling that age discrimination may come into play in school visits. We asked about age in our survey because of these stories from women in particular, who felt that being an older (or younger) woman was a disadvantage when trying to book school visits. We found that at most age levels, male respondents are doing more - many more - school visits than female or non-binary respondents. Given the questions we asked - and didn’t ask - in this survey, we can’t state definitively if age discrimination is a problem in school visits or not. One reason often given for women doing fewer school visits than men is that women are still more likely to be primary caregivers of the very young and very old. Several respondents commented that they had reduced or eliminated their school visits for a period of time due to maternity leave or caring for an elderly relative. 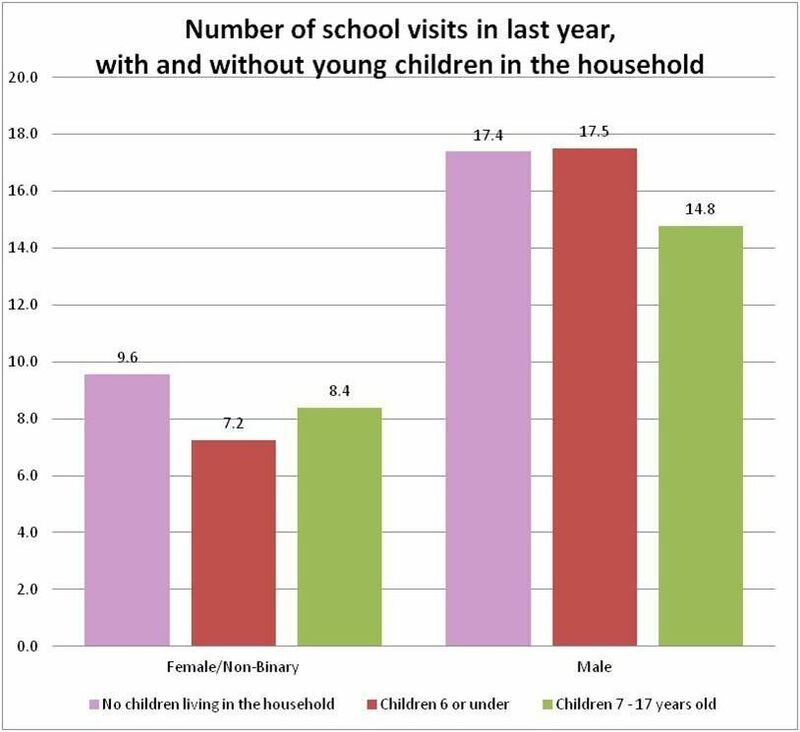 Female/non-binary respondents with children 6 or under in their households did an average of 2.4 fewer school visits than female/non-binary respondents with no children at home (25% fewer visits). Male respondents with children 6 or under in their households had the same average number of visits as men without children in their household. Men with children age 7-17 in the household had a 15% lower average numbers of school visits than did those without children. Female/non-binary respondents had 12.5% lower. With children in the household or without, male respondents did significantly more school visits than female/non-binary respondents. We found that female/non-binary children’s literature creators are earning similar rates for school visits as male creators. However, there is a large gender gap in the number of visits per year of each group. This gap is not fully explained by either caregiving burden or age discrimination. While we cannot answer the “why” behind that gap with this survey, we hope that the knowledge that it exists, and the pricing information that respondents shared, will create a more transparent school visit booking and pricing experience for all children’s literature creators. We (Jeanette Bradley and Michelle Cusolito) volunteered our time and expertise to bring you the results of this survey. We’d appreciate any support you might offer us in return. Perhaps you could buy our books (or rather, pre-order Michelle’s), request them from the library, tweet about them, or write a review if you’ve read them and enjoyed them. Thank you for considering. Jeanette Bradley has been an urban planner, an apprentice pastry chef, and the artist-in-residence for a traveling art museum on a train. (Yes, she is a data nerd who can draw.) Her debut picture book LOVE, MAMA was published by Macmillan/Roaring Brook Press. It contains no cities, pastries, or trains, but was made with lots of love. She currently lives in Rhode Island with her wife and kids. Jeanette is represented by Emily Mitchell of Wernick & Pratt. You’ve landed on Michelle’s blog/website, so you can poke around to learn more about her. In case you missed it, here’s the cover of Flying Deep, which comes out May 22nd.